Every woman wields influence—for either good or bad. And each of us faces situations in which our actions can mean the difference between a tragic or miraculous outcome. In this lively and timely book, popular author Dianna Booher reveals that like the biblical Queen Esther who saved her nation from certain annihilation, Christian women are called to pivotal decision making and bold behavior. In these pages, you will meet modern Esthers such as Nadia, who modeled patience, prayer, and love despite heart-wrenching circumstances; Susan and Fran, who spoke out against unethical activity in their workplaces; and Margaret, who taught giggling preteens how to serve. And meet the original Esther as well to discover her seven secrets for becoming a “high-impact woman”—someone who dynamically affects others with her courage, confidence, control, communication, character, connections, and calmness. The need for caring, proactive women in our country has never been greater. 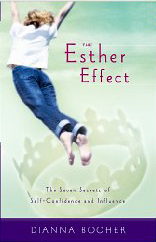 Come meet some of God’s best examples and find out how to start your own Esther Effect.